In 2014, AJP was retained by Tiger Athletic Foundation to design and manage the procurement and construction oversight for a state-of-the-art HD video system for LSU’s Tiger Stadium. The North end zone features a 28′ x 80′ video screen along with two 375 square foot auxiliary displays. The South end zone design included two 40′ x 68′ screens. 1,300′ of fascia displays were also installed in the South, East and West sections of the stadium. All displays were a true 16 mm pixel pitch. 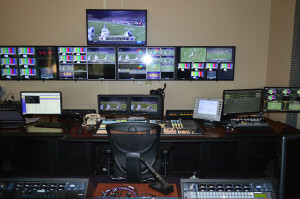 AJP also worked with TAF and LSU on Video Replay Control Room Upgrades and Tiger Stadium’s Sound Reinforcement System. 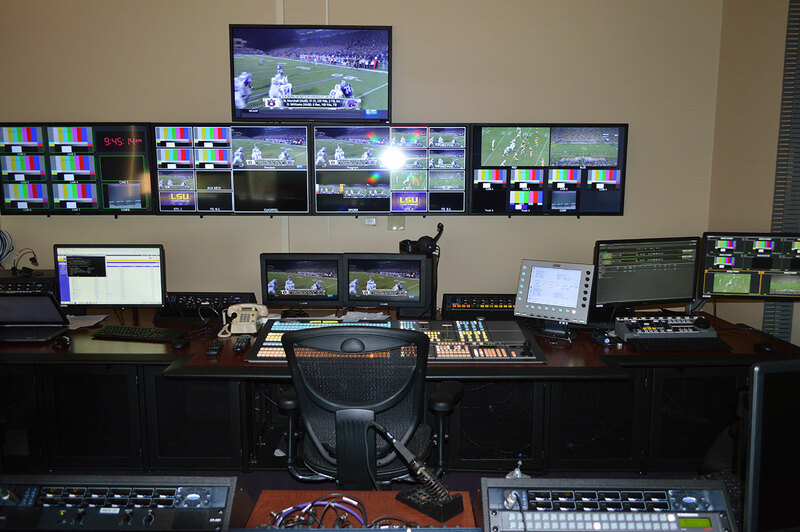 AJP has worked with TAF and LSU on Video Replay AV in the past, and in 2017 was called back for the latest SEC Network requirement upgrades. 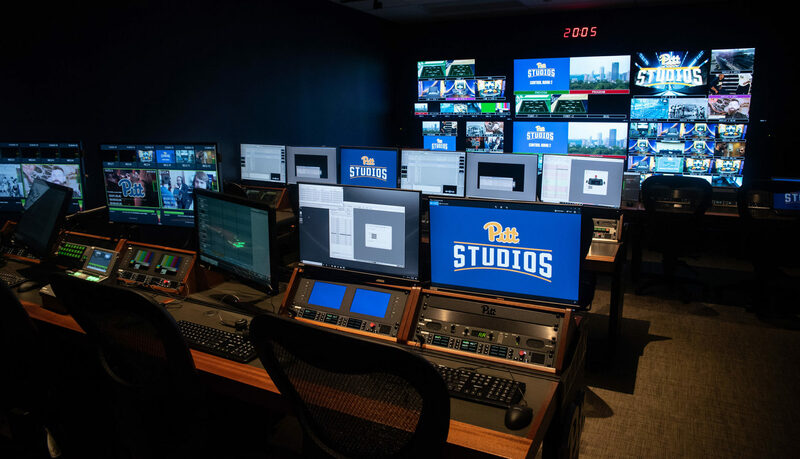 AJP designed and engineered a state-of-the-art (5x) Control Room Broadcast Facility consisting of (2) large “Linear” Production Control Rooms (and associated audio suites) for producing live-to-air SEC events, as well as (3) “Digital” Control Rooms geared to the school’s video replay board shows. 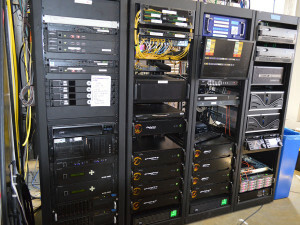 The upgrades centered around a Technical Operation Center with a 750 x 1280 router for distributing signals. AJP also worked on the design and integration of a Shading/Engineering Room to facilitate the shading of over (16) Broadcast Cameras, along with the incoming truck feeds and overall engineering duties of the house plant. 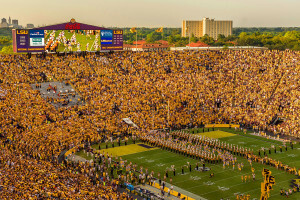 LOGAN, Utah, Sept. 5, 2014: YESCO Electronics has manufactured and installed a state-of-the-art video system for Louisiana State University Tiger Stadium in Baton Rouge. The displays are part of the expansion of the historic 90-year-old stadium. 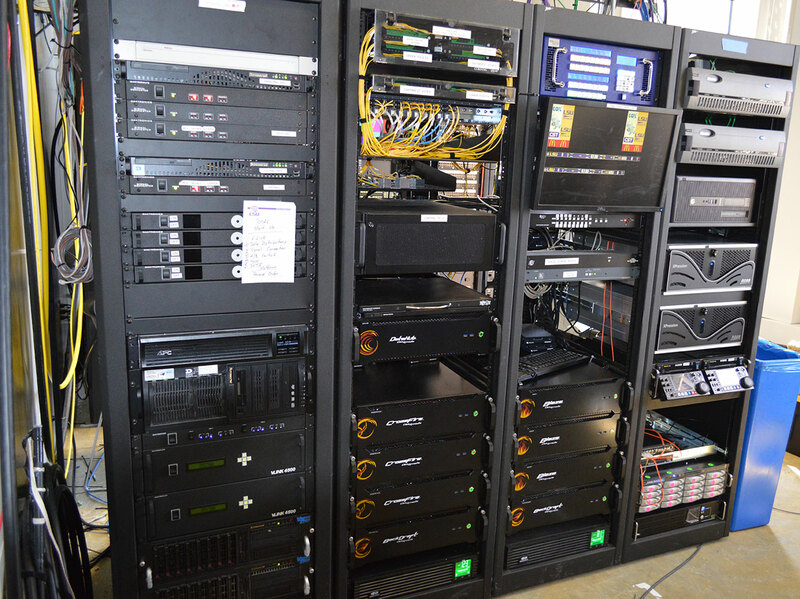 The video upgrades will be turned on for the Tiger’s home opener against Sam Houston State on September 6, 2014. 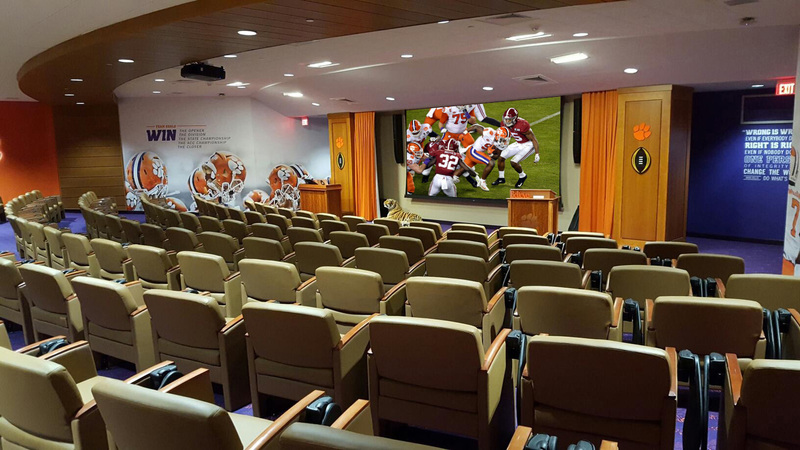 Death Valley fans will watch game time action and instant replays in crisp, high definition detail. 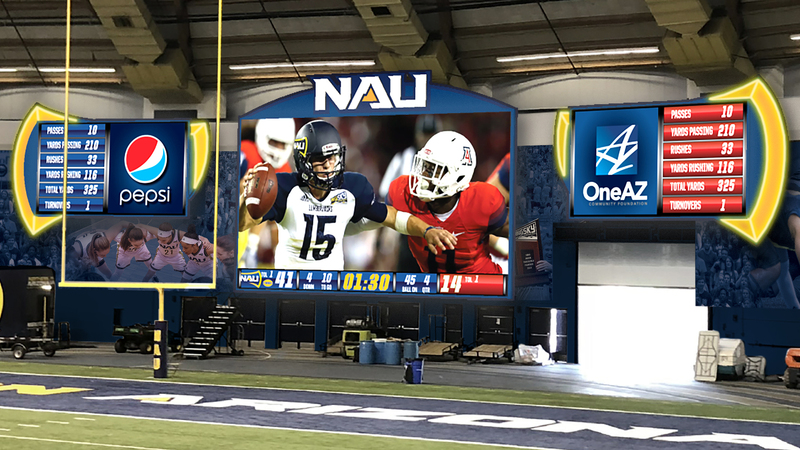 The north end zone features a 28′ x 80′ video screen along with two 375 square foot auxiliary displays. Two 40′ x 68′ screens provide a striking new look to the south end zone. YESCO also manufactured over 1,300′ of fascia displays for the south, east and west sections of the stadium. 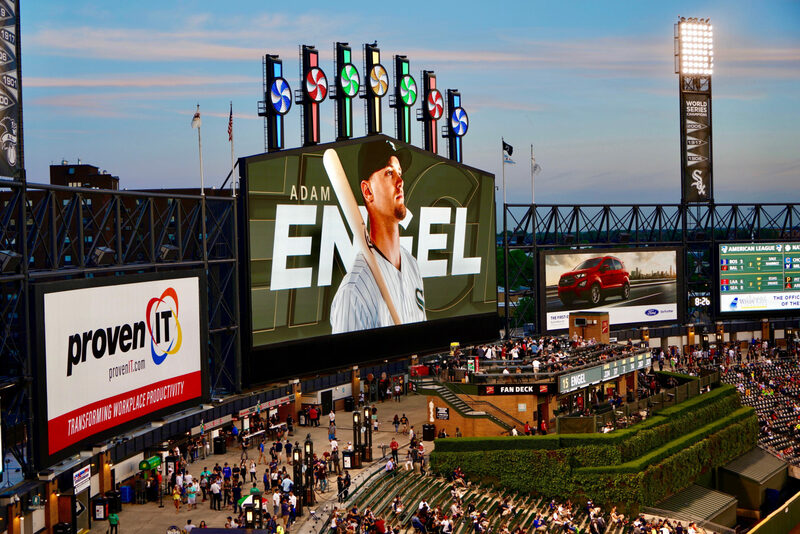 Each video screen features a true 16 mm pixel pitch. The project was designed by Anthony James Partners. YESCO Electronics LED screens are manufactured in the USA and are UL Green Leaf Certified for energy efficiency. Along with the new video screen package, the Tiger Athletic Foundation added an upper deck, suites, and club seats to the stadium’s south end. The added capacity will bring the total to near 102,320, ranking Death Valley among the largest stadiums in the NCAA. Joe Alleva glanced over the row of seats, beyond the metal railing, past the two levels of suites and way, way down to the south end zone of Tiger Stadium. “You’re right on top of it,” Alleva said, wearing dark sunglasses and a protective LSU hardhat. LSU showed off its multimillion dollar makeover to 90-year-old Tiger Stadium on Tuesday, ushering reporters around the 320,000-square-foot addition to the south end zone. Completion of the addition is set for Aug. 22, when crews will deliver food and other materials for the two levels of suites and the above club level. Remaining work includes painting, cleaning and other minor projects, officials said. “We will be done by Aug. 22,” said Emmett David, associate athletic director for facilities and project development. 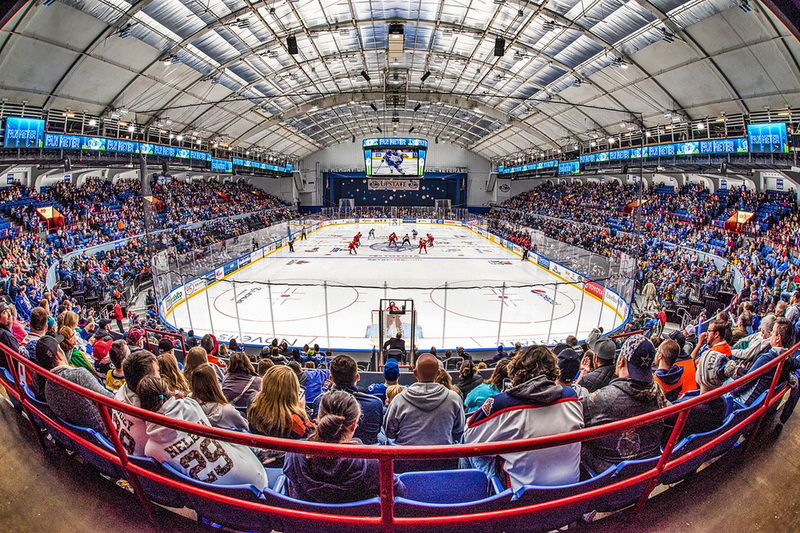 About 300 workers Tuesday pounded away in the four-level addition: two suite levels, club level and a 1,400-seat general admission section above the club floor. The exterior of the addition is days from completion. Between the 40-foot-high HD video screens are two ribbon LED boards stretching from one end of the new expanded end-zone section to the other. One board is stripped above the club level and another below one of the suite levels. The ribbon boards on the east and west sides of the stadium will be replaced to match the new ribbon boards. The boards will be a place for advertisements, closed captions, score updates and more. A “Welcome To Death Valley” sign crawls across the new addition. The sign will illuminate through LEDs, David said. “It’s really nice to see it come to life,” Alleva said, walking around the structure. The exterior of the new expansion will be illuminated in purple and gold lighting to match the exterior of the north end zone. “It will show off the architecture,” said Eddie Nunez, associate A.D. for internal affairs and development. 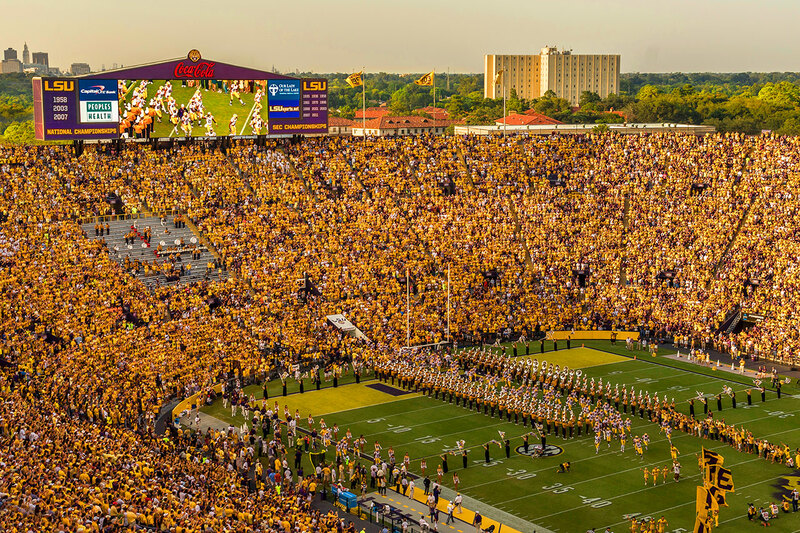 LSU’s listed seating capacity of 102,321 does not include standing-room only, Alleva said. That number does, however, include stadium and concession workers and the teams and personnel. In all, LSU is adding about 8,000 tickets for a game. That includes 3,518 in the suites and 3,000 in the club level along with another 1,400 in the general admission seats. LSU will make an additional $14 million from the south end zone expansion premium seats. All of the premium seating in the club and suite levels are sold, Alleva said.